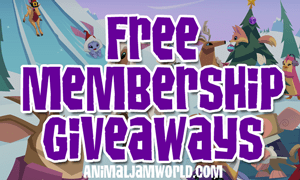 Have you ever wondered if your animal in Animal Jam is feeling lonely? I’m sure any Jammer is giving enough attention to their animals, but what if? 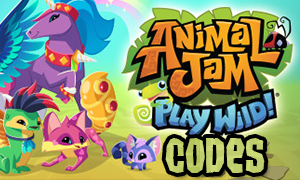 Luckily, it is possible to buy Pets that will accompany your animals through their adventures in Jamaa. Pets are just small animals that follow your main animals around. They look cute, and are great companions to have. You can buy Pets at several locations in Jamaa, such as the Diamond Shop, Flippers N’ Fins, Claws N’ Paws and the Pets-only Party. There is also a Pets section in the Change Your Look menu, where you can choose and buy different Pets. They were first announced on June 9, 2011. 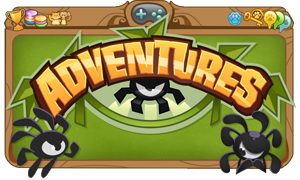 The first Pets appeared into the game on June 23, 2011. Do any of you already own any Pets? Let us know below! 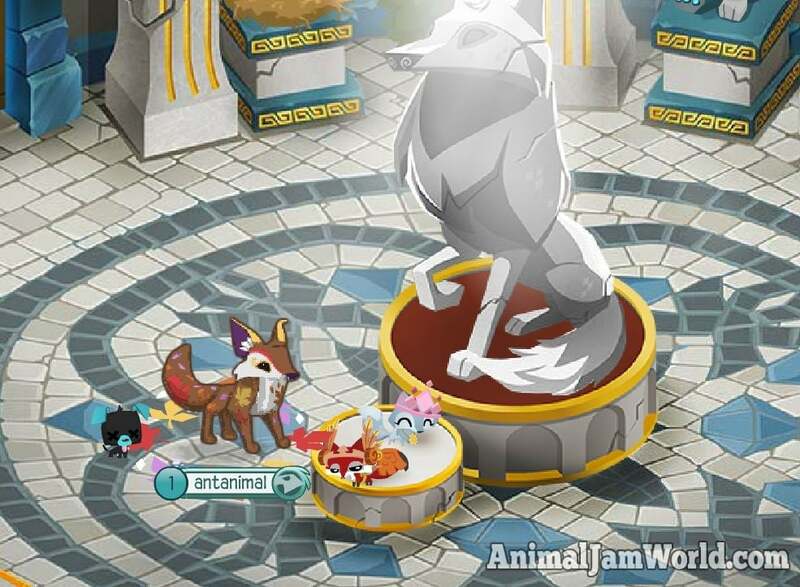 There are a number of different locations where you can buy Pets in Jamaa. However, we are going to take a look at the two easiest ways. 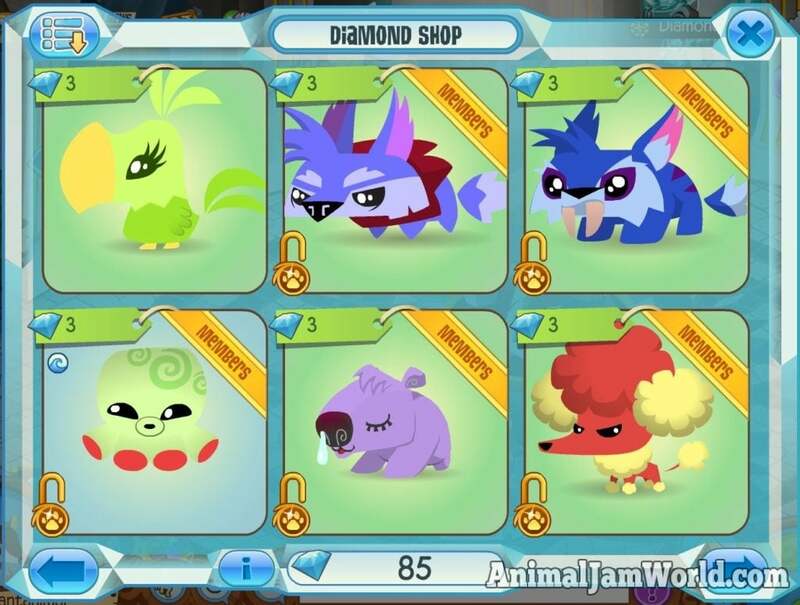 Firstly, you can go to the Diamond Shop in the Jamaa Township to buy Pets. The Diamond Shop is the shop with the Diamond Banners on it. Go inside by going through the front door. Once there, you will see a giant wolf statue in the center of it. Next to the statue, you will find a small crib with baby animals in it. If you click on that crib, it will take you to the Pets store. There, you can select which Pets you want to buy. The Pets at the Diamond Shop cost 3 Diamonds to buy. Another way to easily buy new Pets is by going to the Change Your Look menu. The menu is located at the bottom-left corner of your screen. Just click on your animal’s avatar. 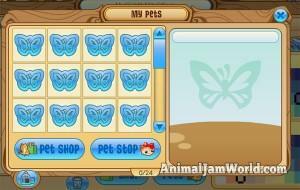 Once you are there, you will see a large “Pets’ button, with a butterfly on it. Click on that button. Now you will see all the pets you own, but you will also see blue butterflies. 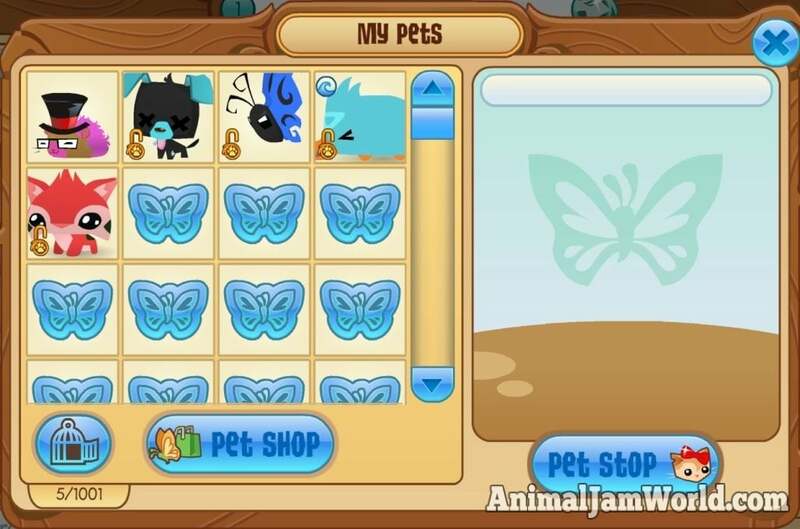 If you click on a blue butterfly, you will see a selection of Pets that you can buy, either with Diamonds or with Gems. They either cost 3 Diamonds, or they cost 450 Gems. Once bought, the Pet will appear at the “My Pets” menu, and you can swap them out if you want another Pet companion. Choosing which Pet you want as a companion can be difficult. 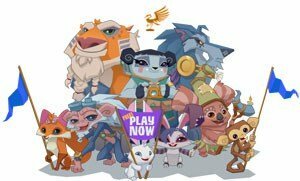 There are over a 1000 Pets in Animal Jam. If you want a different Pet companion, you will need to follow a few steps. 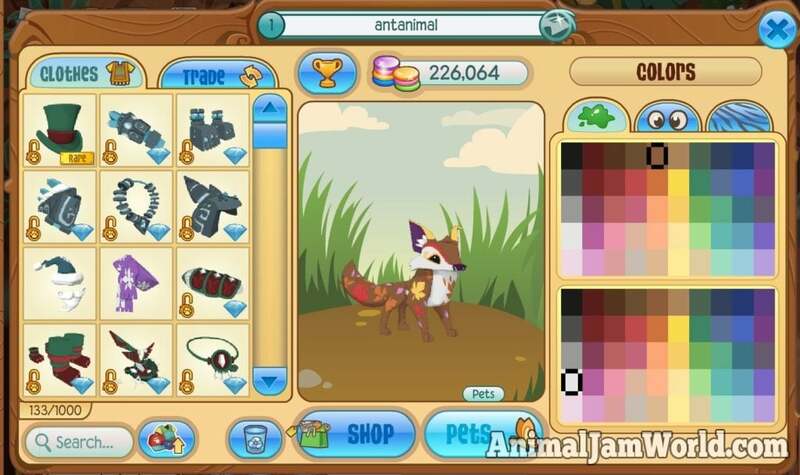 First, you need to go to the Change Your Look menu by clicking on your animal’s avatar. You can find the avatar at the bottom-left corner of your screen. Once you are there, click on the blue “Pets” button. 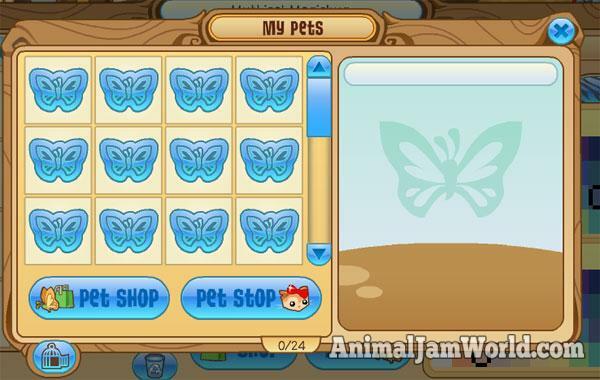 This will take you to the “My Pets” screen, on which you can see every Pet that you own. If you want to choose a different Pet to follow you, simply click on that Pet, and then click on the large X at the top-right corner. This will switch out your Pets. You can also set a Pet free by clicking on the blue “Cage”. 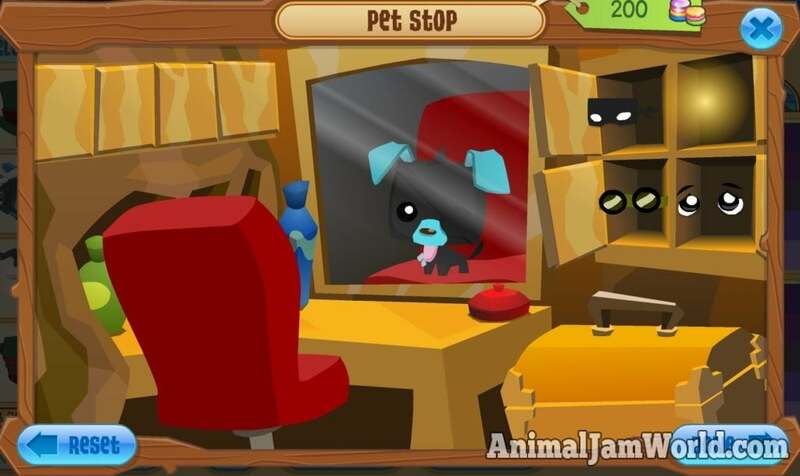 To customize your Pet, you will need to take it to the Pet Stop. Go to the Change Your Look menu, and click on the “Pets” button. Once there, select the Pet that you wish to customize. 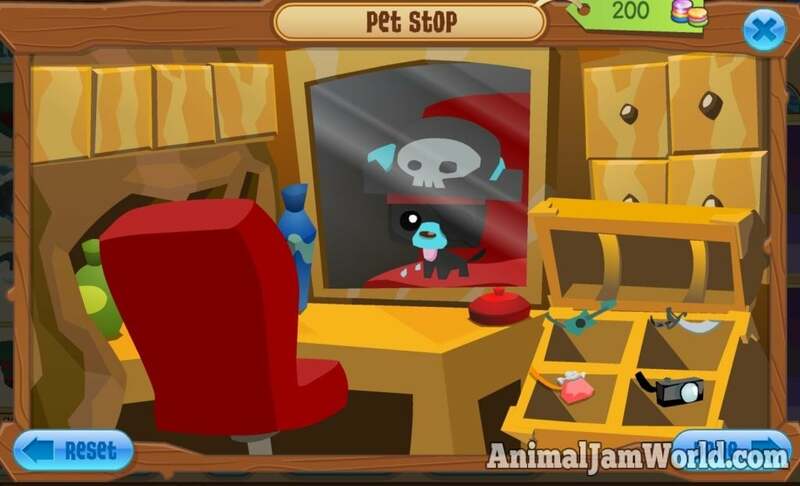 At the bottom-right, you will see a blue button called “Pet Stop”. Click on that button. This will take you to a barbershop-like screen. By hovering your mouse over the cabinets, different kinds of apparel items will appear. Customize your Pet to your liking. When you are done, click on the blue “Done” button. If you are not satisfied, click on the blue “Reset” button to go back. 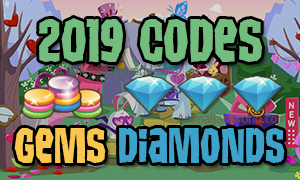 Keep in mind that it will cost you Gems to customize your Pets. 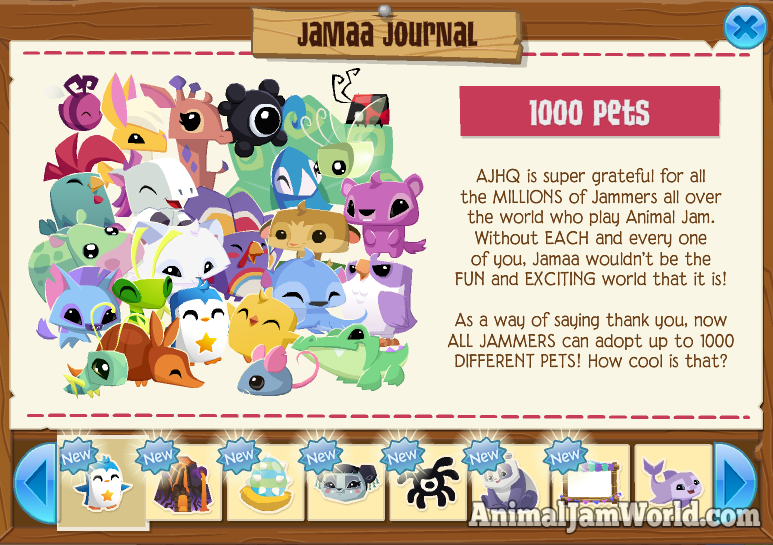 An awesome fact about the Pets in Animal Jam is that there are over a 1000 different ones of them available in Jamaa. AJHQ recently made that announcement, and there was a small celebration. They also thanked everyone for adopting Pets and for playing AJ. If you think 1000 Pets is a high number, what about the fact that there are over 150 thousand different customization options available within the game. If you go even further, and decide to customize your Pet at the Pet Stop, there are over 35 million combinations available! Hi, how can i get a rooster? I saw a person who adopted a rooster today and i want to know how they did it. rooster some time near 4 of July i think srry if im wrong!